Throughout his career, Werner Herzog has been as much an adventurer as a filmmaker. For Aguirre Wrath of God, he traveled to the remote regions of Peru, an area he would return to for 1982’s Fitzcaraldo (in which he dragged a 340-ton steamship over a mountain using nothing but ropes and a tractor). Even at this late stage of his career, he continues to challenge himself (2007’s Encounter at the End of the World was shot on-location in Antarctica), yet his most dangerous undertaking came in 1977 for the movie La Soufriere, a film named after an active volcano on the Caribbean island of Guadalupe that, at the time, was about to erupt. Hoping to capture footage of the expected destruction, Herzog and two cameramen made their way to the island, which by the time they arrived had been evacuated (in most cases, the only signs of life were dogs and other animals left behind by their owners, forced to scavenge for food in order to survive). 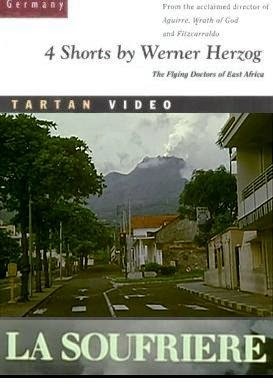 As smoke and fumes bellowed from the nearby volcano, Herzog toured the abandoned streets, and on occasion dragged his camera as close to the mountain as he could (due to a number of tremors that had shaken the area, many of the roads were impassable, littered with fallen rocks and debris). During their travels, Herzog and his crew stumbled upon a trio of local men who didn’t leave with the others, all of whom said they were fully prepared to die. But how long would it be before the volcano finished them off? Along with his experiences on Guadalupe, Herzog (who also acts as the film’s narrator) gives us a brief history lesson about a similar catastrophe that occurred on the island of Martinique in 1902, when Mount Pelee erupted, killing some 30,000 people (ironically, the only survivor of that tragedy was a prisoner who had been locked away in solitary confinement). With its images of lonely streets and vacant homes, La Soufriere takes on a chilling quality, giving the impression that Herzog and his crew are the only people left on earth. This creepy vibe only grows stronger when the director focuses his camera on the volcano, which looks more menacing with each passing scene. Yet as intriguing as La Soufriere is (I was riveted from start to finish), never once do we lose sight of the fact that Herzog put both himself and his assistants in harm’s way; with the volcano predicted to blow at any minute, he seems in no rush to wrap things up, and at times actually ventures closer to the simmering mountain. Yes, it made for a fascinating documentary, but a risky one as well. When he encounters the villagers who refused to leave, Herzog asks them why they’ve purposely put their lives in such jeopardy. It’s a question we could easily pose to the filmmaker himself. My favorite line: "It was a comfort for us not having the law hanging around."